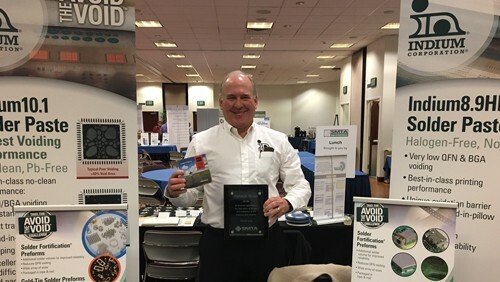 Indium Corporation's Pat Ryan, Worldwide Strategic Sales Consultant, was awarded a Lifetime Achievement award at the Intermountain Boise Expo & Tech Forum in Boise, Idaho. The SMTA's Intermountain Chapter recognized Ryan's industry activities and chapter support over the past 25 years. Ryan joined the SMTA in 1982 and has been actively involved in chapter activities, as well as the SMTA's international organization. Ryan works with the Continental Sales Managers, Product Managers, Applications Engineers, and Global Accounts Managers to develop, facilitate, and implement best-in-class sales practices. He previously served as the Americas Sales Manager, where he was responsible for managing Indium Corporation's field sales team and sales channel partners in all of North, South, and Central America. He joined Indium Corporation in 1995 as a sales manager for the Western USA region, and has more than 25 years of experience in the manufacturing and engineering fields. Ryan has a bachelor's degree in mechanical engineering from the University of Portland. He also serves as the SMTA Intermountain Chapter Vice President of Technical Programs.